"Barrier-free environment" is a kind of humanized space, which aims to ensure people's "right to move", so that all people can participate in social activities together, so that no matter the old, young, injured, healthy people, everyone can be unimpeded, go to every public space at will, want to use all kinds of resources. The United States was the first country in the world to develop standards for designing accessible environments. Its barrier-free environment construction is guaranteed by multi-level legislation. All kinds of barrier-free facilities are arranged in an all-round way and coordinated and unified with the public environment to bring convenience and safety to the disabled and the elderly. The concept of barrier-free design, first named in 1974, is a new concept proposed by the United Nations organization. It emphasizes that in the modern society of the development of science and technology, all about human food and clothing live line public space environment and all kinds of building facilities, equipment, planning and design, must be fully considered with different degree of physical disability defect and normal activity ability decline the use demand, equipped with can satisfy their demand of service function and installations, build a loving and caring, ensure human safety, convenient, comfortable environment for modern life. Barrier-free design is first reflected in urban buildings, transportation, public environment facilities and equipment, as well as the indicating system. The ideal goal of barrier-free design is "barrier-free". Based on the detailed study of human behavior, consciousness and action response, it is committed to optimizing the design of all objects and environments for human use, removing those "obstacles" that make users feel confused and difficult and providing users with the greatest possible convenience. This is the basic idea of barrier-free design. 1960 ~ 1970s, accessibility design concept promotion period. Because in the early 1950s, polio patients gradually grew, and the impact of the second world war and the Korean war caused a large number of disabled soldiers to reintegrate into the American society, it was a great challenge for the American government to settle the livelihood of these wounded soldiers and provide opportunities for their reintegration. In late 1959, the President of the United States appointed city councils to prepare for the establishment of a "barrier-free environment" design baseline. In 1961, the American national standards institute (ANSI) established the "standard specification for the accessibility and accessibility of buildings, facilities and equipment for americans with disabilities", which is the world's earliest code for "barrier-free environment" design. In the same year, the employment act for persons with disabilities was enacted, stipulating that employers should not exclude employment opportunities for persons with disabilities. At the same time due to the disabled person return to society, into the enterprise service, enterprise related buildings must comply with the use of the convenience for the disabled, so the U.S. government in 1968 formulated the "ruled out building barriers act", ruled that all the construction of buildings or the U.S. government funded by the federal government financing of the new building and renovation of buildings, at least for the disabled in a gateway, must ensure the accessibility of disabled persons and the rights of use. In the 1970s, disabled people automatically launched the qualification life movement of "disabled people don't show mercy, and ask for independent services and environmental equipment". In the 1970s, due to the rapid expansion of highways in the United States and the improvement of vehicle performance and the acceleration of vehicle form, many accidents occurred, and the number of people with spinal cord injuries in the lower body of society increased rapidly. And because most of America's soldiers returning from the Vietnam war are quadriplegic with spinal cord injuries, the government needs to take action. In order to specify the 1968 "building obstacle removal act" into the design specification, it was made in 1982 "the minimum design guide to meet the building obstacle removal conditions and ensure the accessibility of buildings and facilities from the perspectives of building environment, transportation, communication and so on". In 1988, the fair housing supplemental act of the United States was amended to expand the citizenship rights of disabled people, requiring that civil buildings must also consider the accessibility environment. It is stipulated that for newly built collective houses with more than four households, handrails must be installed at entrances, passageways, buttons, toilets, bathrooms, etc., taking the needs of the disabled into consideration. From 1990 to present, from barrier-free environment design to universal design. As early as the 1970s, professor Ronald l. ace of north Carolina state university proposed the idea that "design should not be different based on age, ability and gender, but should be designed for all". This is what we often refer to today as "universal design", which emphasizes the concept of "universal design" not only for the disabled but also for "all people". The main factor is that in the social background impact of the rapid increase of the elderly population, the elderly consumer population has an overwhelming influence. Many enterprises are concerned about the purchasing power of the elderly population and the consumer market, resulting in innovative design reforms in the enterprise and educational environment. 1990 the President of the United States signed the americans with disabilities act. It is the most legally binding disability support act in the United States, with the primary goal of fully ensuring the human rights and lives of 43 million people with disabilities. In terms of building barrier-free design technology, the United States takes the principle of equal participation of disabled people in social politics, cultural life and Shared social public welfare facilities as the principle, and treats them differently according to needs and may be divided into "general" and "individual". In general public buildings for the disabled access and use of only routine arrangements, and do not do special needs processing, individual difficulties through improved service management and other ways to solve. This simplifies facilities, saves money and is easy to promote. On the other hand, in the buildings where the disabled live, more measures have been taken according to the special requirements of users, including the flexible adjustment of building facilities, so as to make the passage safe and convenient for the disabled. Important historical and cultural buildings have also been transformed accordingly. For example, the Lincoln memorial: the newly added outdoor access ramp, using the same water brush beanstone as the pavement nearby, looks extremely simple and integrated with the main building and the surrounding environment. The disabled enter the memorial hall from the entrance at the side of the steps and take the hydraulic elevator to the exhibition hall on the upper level. 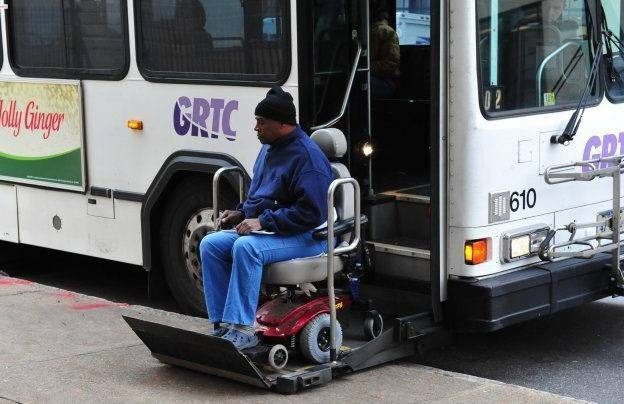 In order to ensure barrier-free transportation, the accessibility implementation rules for vehicles for the disabled in the United States were formulated in 1991 and revised in 1998. The rules respectively set the accessibility standards and specifications for different vehicle systems and made special requirements for different types of vehicles. For example, the bus system is required to be equipped with lifting AIDS, doors, steps, thresholds, end points and routes should be designed to meet the requirements of barrier-free, etc., while the railway system of vehicles are required to achieve a barrier-free toilet and compartment. China's barrier-free environment started relatively late. Since the mid-1980s in Shanghai, barrier-free facilities have been built in some large shopping malls, cinemas and railway stations. In the early 1990s, blind lanes were laid for some major joints. On August 1, 2001, the code for barrier-free design of urban roads and buildings was issued. Although China has been promoting "barrier-free design" in the field of architectural space design for more than 20 years, it is still only a term in the field of architectural space design, and it is not yet possible to build a barrier-free society. At present, the trend of the world has shifted from "barrier-free design" which only focuses on architectural space to "universal design" which covers the categories of products, equipment, space, buildings, communication systems and service industries. No matter it is "barrier-free design" or "universal design", its potential objects of use should be extended to all the citizens, and its scope should also cover the whole life level of clothing, food, housing and transportation. Although the barrier-free design in China has made great progress, it still has a long way to go compared with the developed countries in Europe and America.